Clothing budgets are being stretched very thin these days for many. Getting quality clothing at an affordable price is sometimes a challenge. Besides the yard sales, thrift stores, and hand me downs, holding a clothing swap is a great way to clothe your family for little to nothing. To start your own clothing swap, all you need are clothes and friends. Got them? Let’s do this, then! Gather your friends together and decide on a few rules. Will it just be your group, or will it be open to the public? How many items will you bring in for each item traded? Will you do a straight 1:1 trade or do you want 3 items brought in for each item taken? Will 1 pair of jeans be good for 2 shirts, or do you want 3 pairs of shorts for a coat? Will you use coupons, tickets, or the honor system to keep track? Who will set up and who will clean up? What will constitute a stain, or excessive wear and tear on clothing? Who is the final judge? What will you do with any leftovers? Find and decide on a location and a day to hold your swap. Churches, personal homes, or even a park pavillion in good weather are great choices. (check with your parks and rec dept on rules using the pavillions, first). You want to hold your swap at a time convenient for most of those involved, obviously. You’ll need space for tables or a clothesline to hang up clothes as well as room for people to “shop”. Gather the clothing. Separate it out into sizes, seasons, and types. Sweaters and coats in one area, shorts and tank tops in another. Check for stains, wear and tear according to rules you set up earlier. Ensure that each participant gets their tickets or coupons to shop, if that is part of your rules. Fold or hang clothing neatly. Have fun with your friends while doing this…maybe add some coffee and a treat or two while setting up! SHOP! Decide who goes first, and who will run the ticket collection area first. If you have this open to the public, and others will be bringing clothing at different times, have someone available to check them in as well. Make sure that newcomers understand your group rules, and agree to abide by them. Make sure that you have some bags or boxes available for others to take items home in as well. Have fun getting some new-to-you clothing for you and your family for free! That outgrown coat of your daughters will be put to great use on another girl, while she is enjoying a “new” pair of jeans. Clean up. This is the the most “unfun” part. But, since you decided in advance who would set up and clean up, this won’t be difficult. You’ve already decided what to do with leftovers, so if they are to be donated, make sure that someone is responsible for that, and that tables are put away and the home, church space or park are just as clean as when you arrived…of course you knew that already! Talk about the swap with other participants while you clean up, and figure out what worked and what didn’t work so well. Was it enough time for shopping? Did you have enough participants? Do you need to advertise more next time? This will help you get ready for your next one! 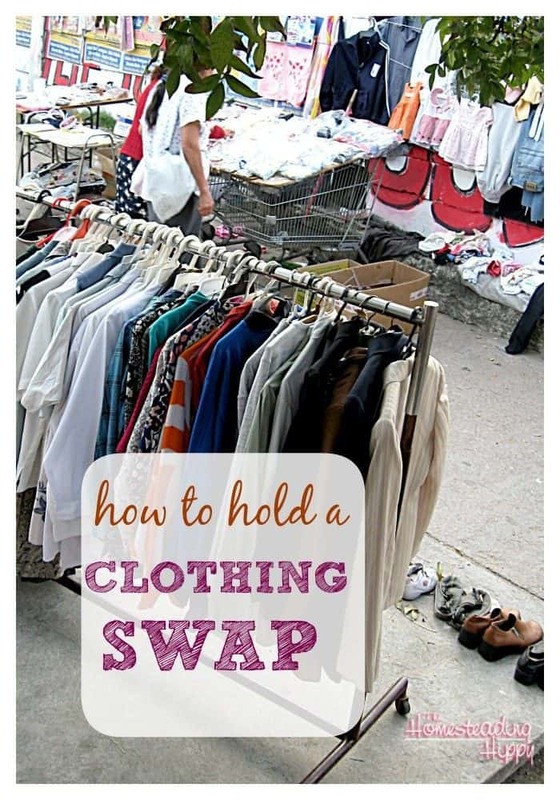 Have you ever had a clothing swap? What was your experience with it? I’ve never participated in a clothing swap. I always take my clothes to consignment and let them handle the “hard work” for me.. but then I use my credit to purchase more clothes. What a great idea…especially when money is tight. Great idea!! I have so lots of clothes from my boys. I have never had a clothing swap but it sounds like an amazing idea. I think it is best to trade clothing rather then throw it out. I am a full believer in donation to reduce waste. This would be a great thing to host. It’s not something I had ever thought about before. I can see us doing this with our homeschool group. I wish I had known this when my kids were small. My boys sometime only got to wear their clothes a couple of times before they were too small. I don’t know how this would work with adults I’m friends with though. I definitely need to do this. Kids out grow their clothes so fast! I would love to do this. I think a home decor swap would be great as well. It would make a nice way to get rid of things you no longer need and gain something “new”. I really should try an set something up like this for our area. We have so many kids that would benefit from this. I ought to do one of these–we have enough clothes in smaller sizes to open our own store, lol.